Ever wished you could see at a glance whether your network has changed without having to click on the Wifi icon in the Status bar to check the currently active connection? I know I have, particularly when toting the laptop between work, home and coffee shop. Although you can require admin approval for changing networks in System Preferences, in practice that can often be quite disruptive. It also has the potential to expose your login password in public places or situations where it might be awkward or inconvenient to insist on privacy while you type it in. It would be easier, it seemed to me, if I could just always see the name of the currently connected network in the Status bar, instead of having to actively go and look to see if it has changed. I decided to solve the problem by writing my own little Wifi Display utility, which I’m sharing here for free for anyone that has a similar need. The Wifi Display.app simply displays the currently active SSID Wifi name in the Status bar. You can command-drag the Wifi name along the Status bar to move it next to your Wifi icon for visual contiguity. The app is sandboxed and signed with my Apple developer ID. Wifi Display is free to use and requires macOS 10.10 Yosemite or higher. Comments Off on SIP’s soft underbelly – a hiding place for malware? It’s been a truism on macOS for some time that the most reviled piece of software on the platform is MacKeeper, but brother-in-arms Advanced Mac Cleaner must be running it a close second. Advanced Mac Cleaner is produced by PCVark and has many incarnations. Aside from ‘AMC’, it’s also distributed as Mac Tonic, Mac Mechanic, Malware-Crusher, Mac Optimizer and now, the most recent form we’re seeing, Mac Auto Fixer. You can also save yourself a whole lot of grief by using my shareware troubleshooting tool DetectX Swift, which will not only find all these pesky elements for you, it’ll remove them all for you, too. There’s no requirement to pay, we don’t mind ridding your Mac of this stuff for free! Comments Off on Advanced Mac Cleaner strikes again! Want to remove MacKeeper? The easiest way is to use my free/shareware app DetectX Swift, but if you’re looking to do it yourself, here’s the complete list of all past and current known filepaths. Bear in mind that DetectX Swift can find other MacKeeper paths that are not on the list due to its internal search heuristics; however, I’ll update this list as new paths come to light. If you happen to find any that are not on the list, please share in the comments! /Library/Security/SecurityAgentPlugins/MKAuthPlugin.bundle -- warning: deleting this file could harm your Mac! Contact me for help. Earlier this year, Digita Security’s Patrick Wardle took apart a cross-platform backdoor trojan he nicknamed ”ColdRoot’. Wardle was retro-hunting possible malware by searching for apps on VirusTotal that access Apple’s TCC privacy database. For those unfamiliar, TCC.db is the database that backs the System Preferences > Security & Privacy | Accessibility preferences pane and which controls, among other things, whether applications are allowed access to the Mac’s Accessibility features. Of interest from a security angle is that one of the permissions an app with access to Accessibility can gain is the ability to simulate user clicks, such as clicking “OK” and similar buttons in authorisation dialogs. 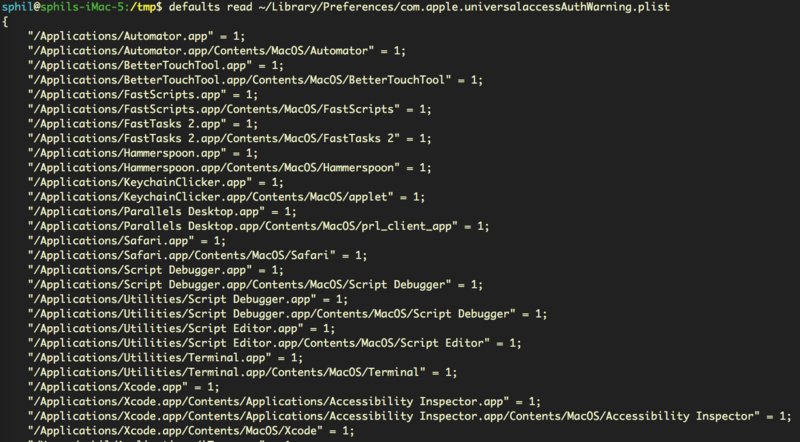 there is no legitimate or benign reason why non-Apple code should ever reference [the TCC.db] file! While in general that is probably true, there is at least one good reason I can think of why a legitimate app might reference that file: reading the TCC.db used to be the easiest way to programmatically retrieve the list of apps that are allowed Accessibility privileges, and one reason why a piece of software might well want to do that is if it’s a piece of security software like DetectX Swift. If your aim is to inform unsuspecting users of any changes or oddities in the list (such as adware, malware or just sneaky apps that want to backdoor you for their own ends), then reading TCC.db directly is the best way to get that information. We can see from the output that LaunchBar and Safari both have the ‘allowed’ integer set to ‘0’ (the middle of the three values in “0|0|1”) , whereas all the other apps have it set to ‘1’ (“0|1|1”). However, there remains a case (as I will demonstrate shortly) where developers may well need to know whether apps other than their own are, or are not, in the list. Moreover, there doesn’t seem to be any obvious vulnerability in allowing read access to that data, just so long as the write protection remains, as it does, in place. The use case for being able to read the TCC.db database is clearly demonstrated by apps like DetectX Swift: security apps that conform to the principle of least privilege, always a good maxim to follow whenever practical. Asking users to grant elevated privileges just to check which apps are in Accessibility is akin to opening the bank vault in order to do an employee head count. Surely, it would be more secure to be able to determine who, if anyone, is in the vault without having to actually take the risk of unlocking the door. Did they put a CCTV in there? Without direct access to TCC.db, we might wonder whether there are any other less obvious ways by which we can determine which apps are able to access Accessibility features. There are three possibilities for keeping an eye on bad actors trying to exploit Accessibility without acquiring elevated privileges ourselves, each of which has some drawbacks. That gives us a list of all the apps that macOS has ever thrown the ‘some.app would like permission to control your computer’ dialog alert for, along with an indication of the user’s response (1= they opened sys prefs, 0= they hit Deny). This list could prove useful for identifying adware installers that try to trick users into allowing them into Accessibility (looking at you, PDFPronto and friends), but it’s main drawback is that the list is historical and doesn’t indicate the current denizens of Accessibility. It doesn’t tell us whether the apps in the list are currently approved or not, only that each app listed once presented the user with the option of opening System Preferences and what the user chose to do about it at that time. This ability was in fact added to DetectX Swift in version 1.04. Even so, notification of the change is at least something we can present to the user. Alas, this is only useful if the app that’s receiving the notification is actually running at the time the change occurs. For an on-demand search tool like DetectX Swift, which is only active when the user launches it, the notification is quite likely to be missed. It would be nice, at least, if Apple would provide a more useful notification or an API for developers wishing to keep their users safe and informed. The lack of a userInfo dictionary in the notification was apparently reported as a bug to Apple several years back, but I suppose it could always use a dupe. Fantastic! There’s just one problem. While this AppleScript does not require blanket elevated privileges to run – in short, it doesn’t require an administrator password – it does need to be run by an app that is itself already in the list of Accessibility apps. If you have a script runner like Apple’s Script Editor, or third-party tools like Script Debugger or FastScripts, already approved in Accessibility, then you can run it without authorisation. It’s also worth noting that the script relies on launching and quitting System Preferences, which it attempts to do as quietly as possible. As for DetectX Swift, I may consider adding something like this to a future version as an option for users who are happy to add DetectX to the list of apps in Accessibility. Have your own tips about accessing TCC.db? Let us know in the Comments!